UV/Visible Spectrometer Model UV-BT 770/770PC - Analytical Equipment - Products - Brite Technologies, Ultimate Laboratory Solutions, Analytical Equipment, Clinical/ Medical Education Products, Refrigerators (scientific), Laboratory Equipments (axiom Gmbh), Canada. UV-BT-770/770PC deliver enhance ease-of-use, precision and accuracy resulting in time and cost savings, as well as excellent performance for measurements in the range of 190nm to 1100nm. UV-BT-770/770PC suitable for qualitative and quantitative analyses for clinical lab applications, pharmaceutical, Petro-chemistry Lab, education labs , food processing , agricultural , kinetics, wavelength scanning, multiple components and DNA/Protein analysis. The comprehensive features, sophisticated powerful software, variety of accessories and model configurations will meet or exceed your expectations for performance and value. Powerful build –in-program or PC windows based software offers photometric mode, quantitative test (standard curve), wavelength scan, Kinetics, DNA/Protein, multi wavelength, system utilities. 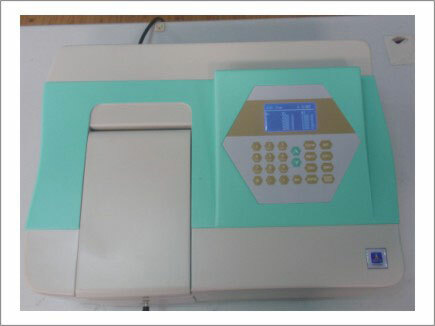 Spectrometer has a large LCD screen which displays the menu screen and makes the spectrometer user friendly.